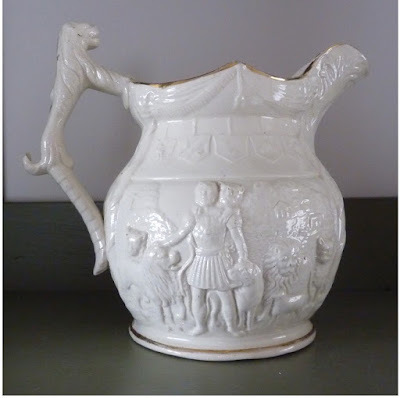 I enjoy learning new things from transferware patterns, so my curiosity was piqued by a child's mug posted on the Transferware Collectors Club Facebook page. 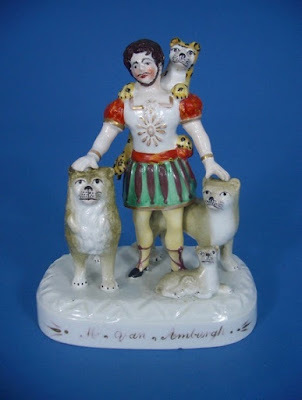 It showed the inscription "Mr. Van Amburgh/The Night Of The Queens (sic) Visit to Drury" under the pattern of a man dressed in Roman garb and surrounded by large wild cats. I learned that Isaac Van Amburgh (1811-1865) was an American animal trainer and menagerie owner who conquered Europe with his daring animal acts. (He is said to be the first man to put his head in the mouth of a lion.) The young Queen Victoria was so taken with Van Amburgh that she visited his show at the Drury Lane Theater seven times in eight weeks (this number varies). She also commissioned Sir Edwin Landseer (1803-1873) to paint his portrait in 1839. The painting of Van Amburgh and his menagerie is still part of the Royal Collection Trust. 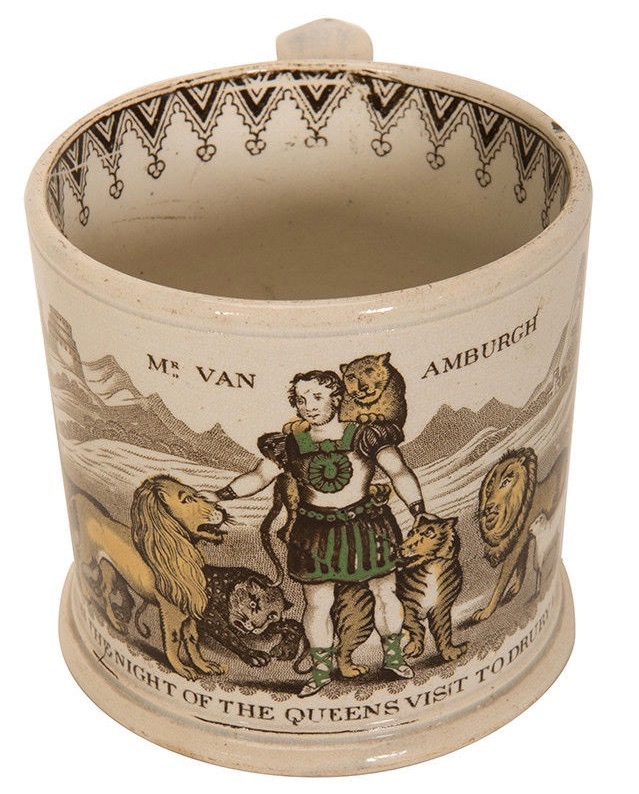 John & Robert Godwin (1834-1865) child's mug "Mr. Van Amburgh/As He Appeared On The Night Of The Queens (sic) Visit To Drury Lane Theatre." An amusing discussion of the Van Amburgh pattern is found on p. 35 in the book "Victoria Remembered" by John May; "Here, as the Brute Tamer of Pompeii, in a sort of very early Victorian Cecil B. de Mille version of a gladiator's kit, he put himself and his lions and tigers and his leopards through their paces." 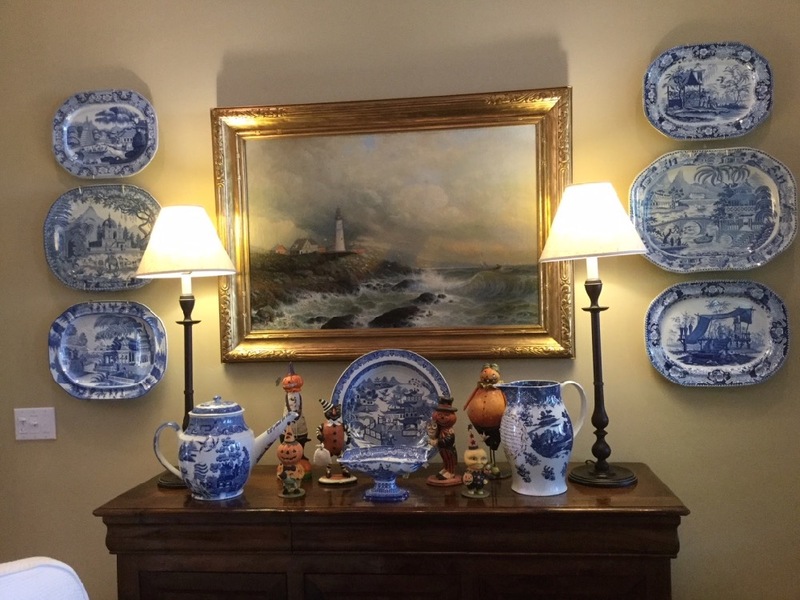 Thank you to Potter & Potter Auctions, Inc. for permission to use the photo. 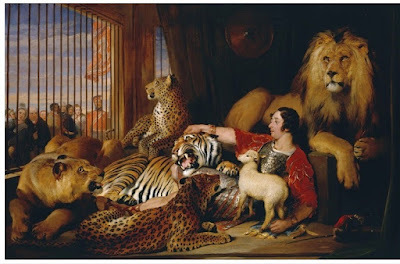 Edwin Landseer "Isaac Van Amburgh and his Animals" 1839. Notice there is a small lamb in the cage of wild beasts. Van Amburgh created a live show out of the words of Isaiah 11:6: "The wolf also shall dwell with the lamb, and the leopard shall lie down with the kid; and the calf and the young lion and the fatling together; and a little child shall lead them." No wolves, fatlings or kids, but the lions, leopards, and lamb are in the same cage! Along with Van Amburgh. Such showmanship! 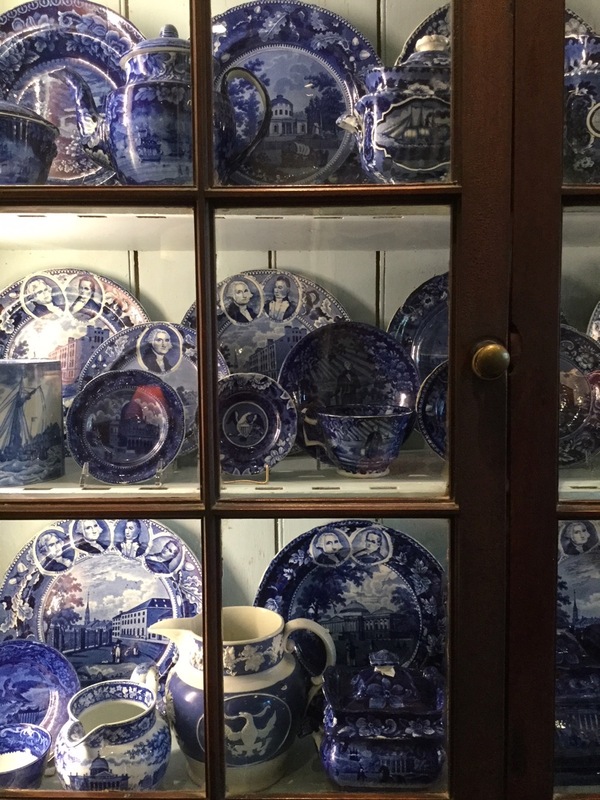 Van Amburgh was so popular that other kinds of inexpensive ceramics, along with transferware, were made as souvenirs. 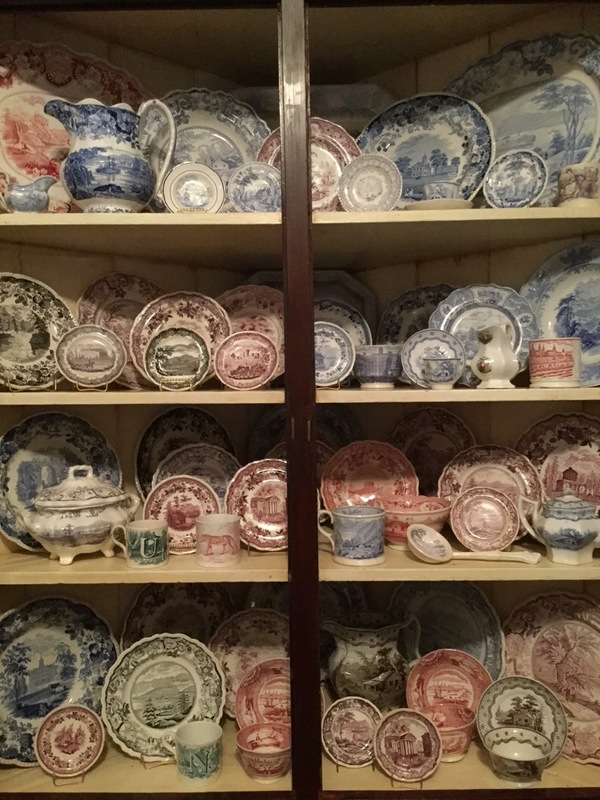 It is possible that the ceramics were sold at the theaters where Van Amburgh performed. The back of the Staffordshire figure seen above. I like the leopard clinging to Van Amburgh's shoulders. A 6.75 inch relief-molded jug with Van Amburgh and his lions and other large cats. 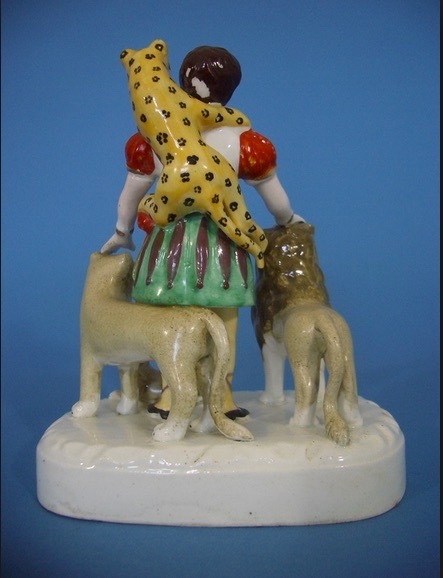 Notice the lion handle. 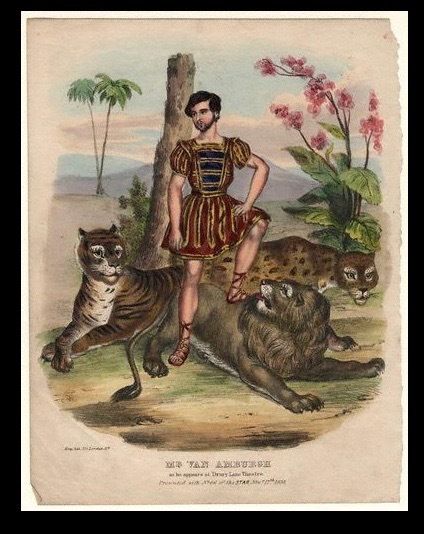 Van Amburgh was known as "The Lion King," but it appears he was king through extreme animal cruelty. There were complaints about Van Amburgh's training methods at a time when slavery was still legal in much of the world, including the United States. That said, Van Amburgh died in bed of a coronary in 1865. No revenge of the beasts for him. One more photo. Here is Van Amburgh in his youth. The lithograph is from The National Portrait Gallery in London. I am standing in the middle of an astounding collection of transferware printed with American historical patterns. 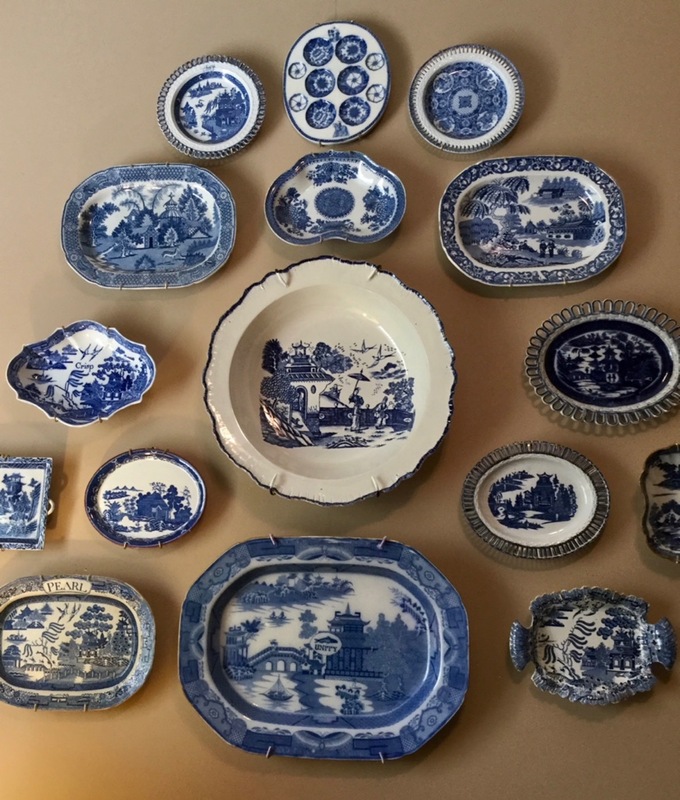 Most of the transferware seen here dates from the 1820s. 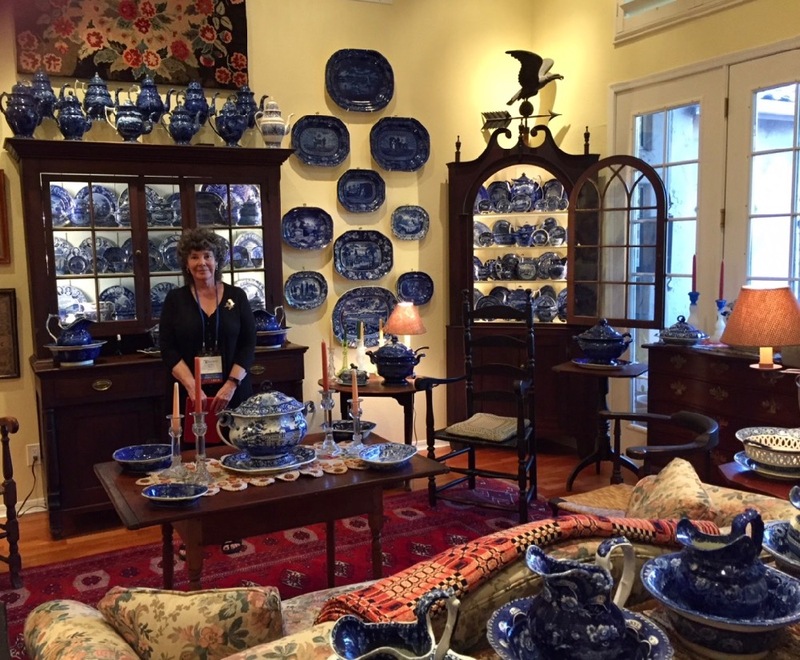 The Transferware Collectors Club Annual Meeting was in Phoenix, Arizona this year. Some members wondered if there would be much transferware in a city that was far removed from the transferware centers in Britain and the East Coast of the United States. 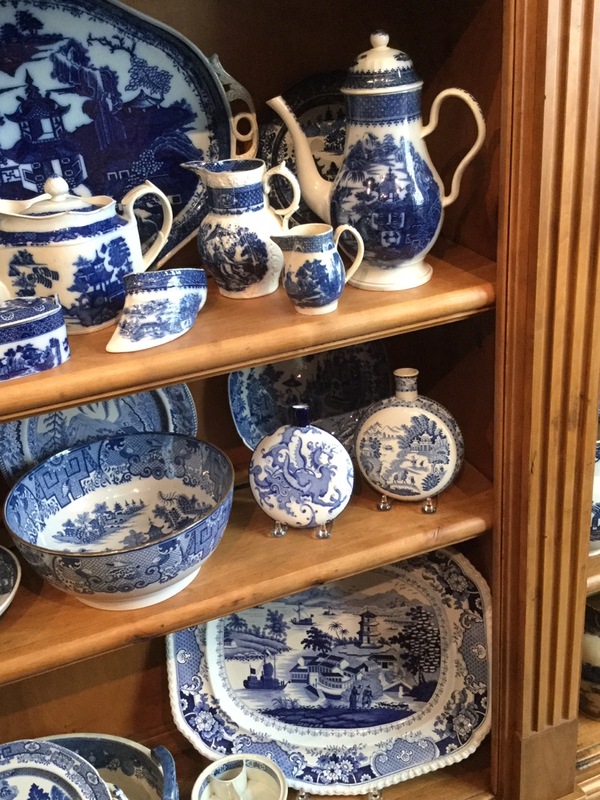 They needn't have worried, as two huge collections of transferware are located in Phoenix. 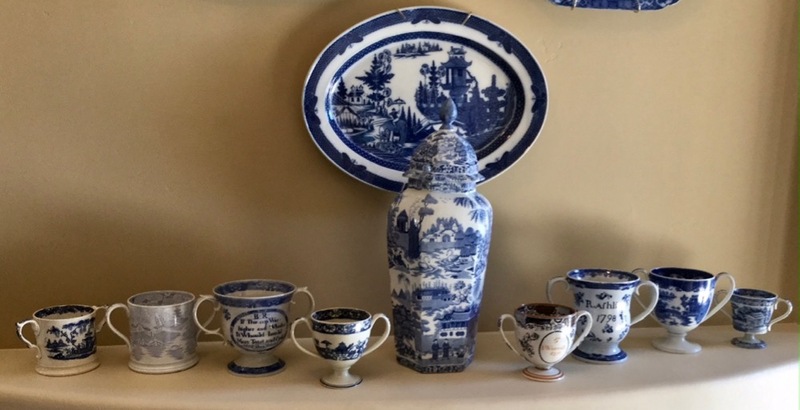 One of the collections is comprised of American historical patterns and the other collection features Chinoiserie patterns. The first photo shows me standing in a living room filled with mainly dark blue transferware printed with scenes of early America. 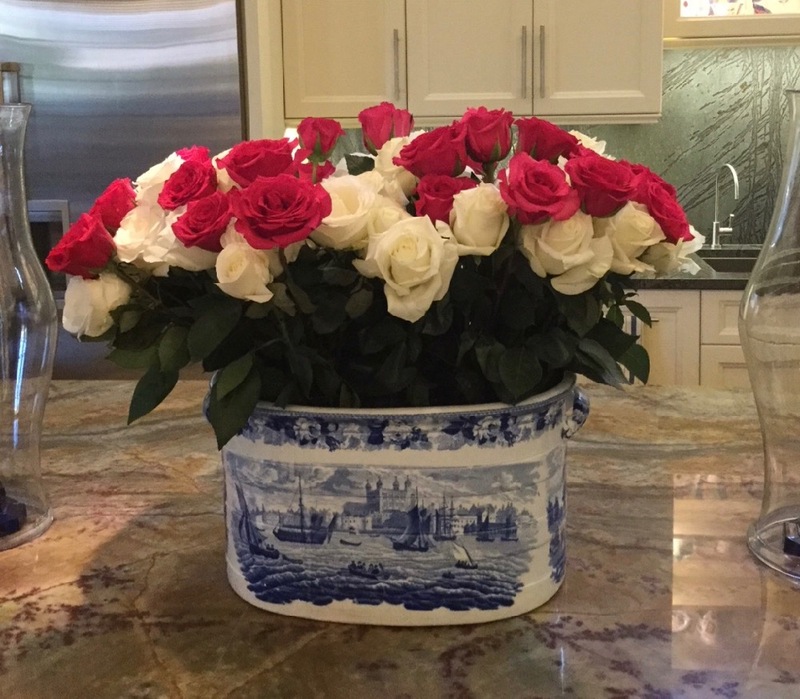 It may be the desert outside, but inside it looks like New England! 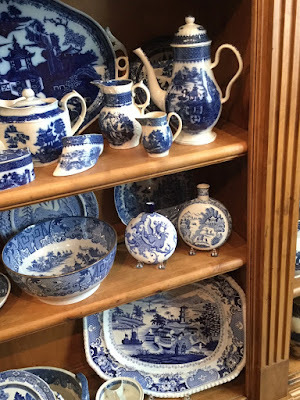 There is so much I want you to see that I'll begin by showing you close-ups of the corner cupboard and the cabinet seen in the photo above. 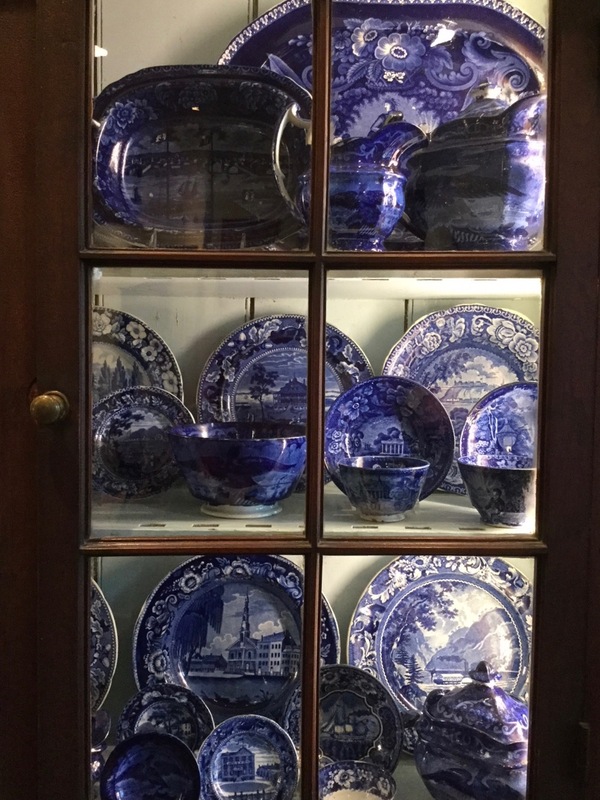 Corner cupboard filled with Historical Blue! Click on the photo to make it larger! I am standing in front of the cupboard. Look inside! Shown is the right side of the cupboard. Click to enlarge. Shown is the left side of the cupboard. Not all historical transferware is blue! 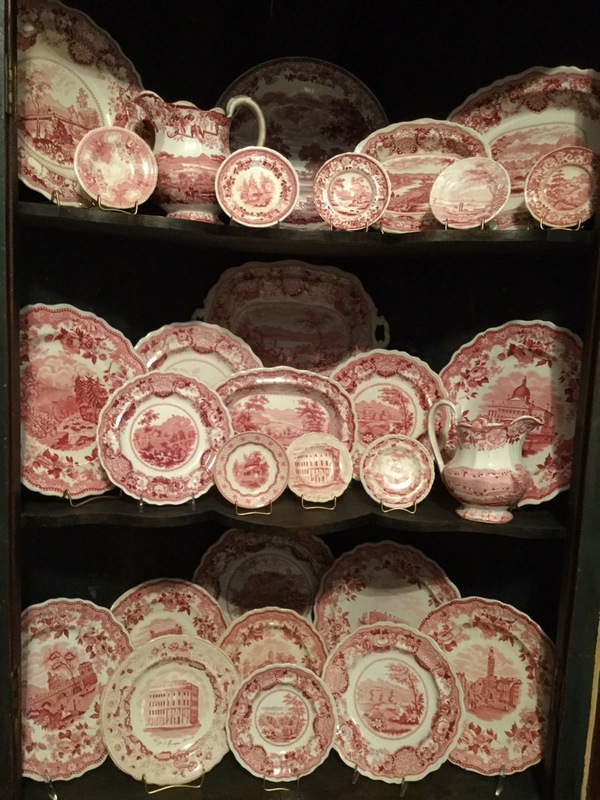 Transferware with American historical views printed in red. 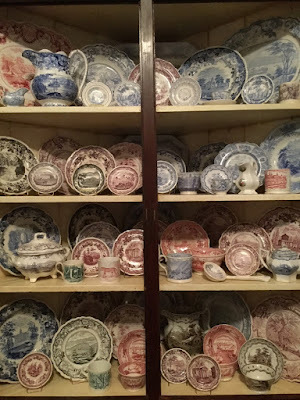 Historical patterns were printed in lots of colors by the 1830s. Not everything is in cupboards. Lots of items are hung on the wall and placed on tables and counters. Four Clews States platters and more! 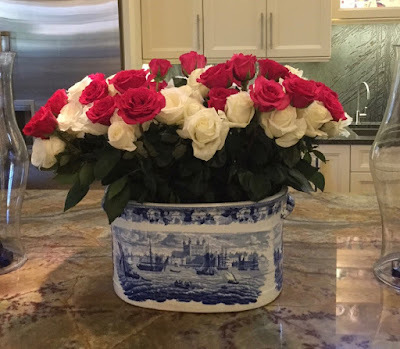 Why not fill a foot bath with roses? 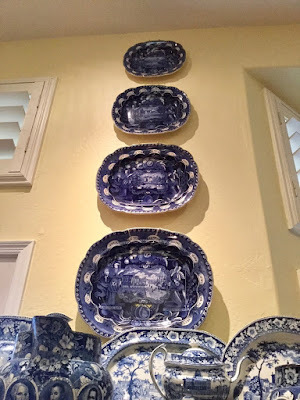 The pattern here is an English view: Wedgwood "Tower of London." 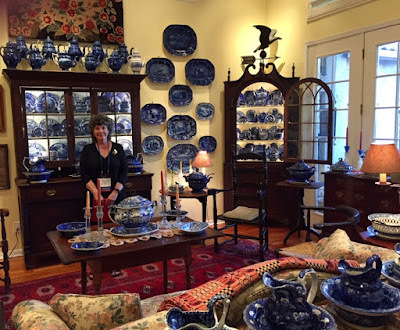 Now we will segue to an extraordinary collection of unusual Chinoiserie patterns and shapes. Chinoiserie patterns on a beautifully painted wall. 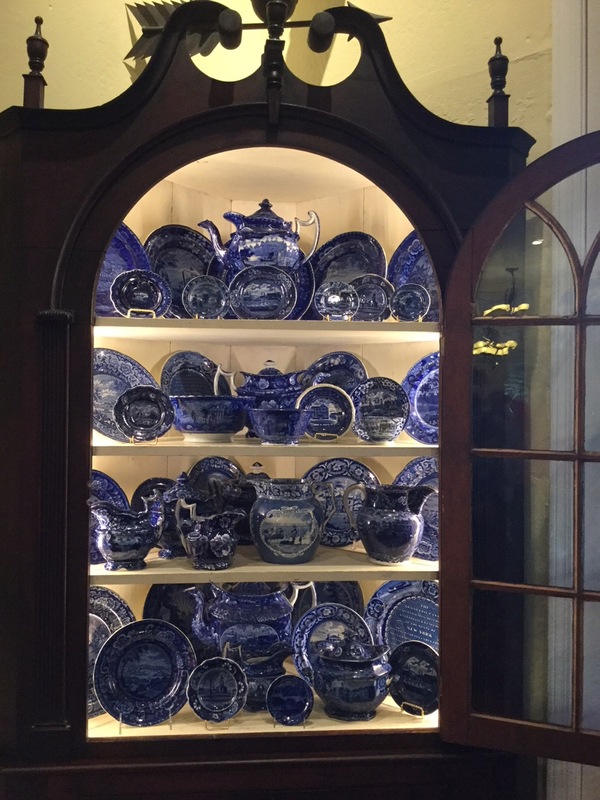 Transferware adds beauty to any setting. 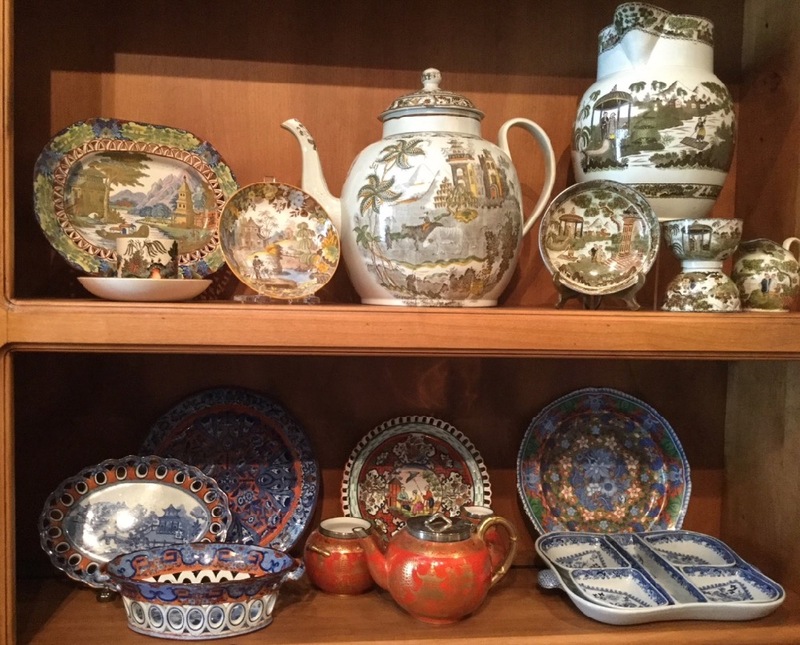 Chinoiserie patterns in brown and other colors. A collection of loving cups and more. Shelves filled with treasures. For example, notice the flasks on the middle shelf. 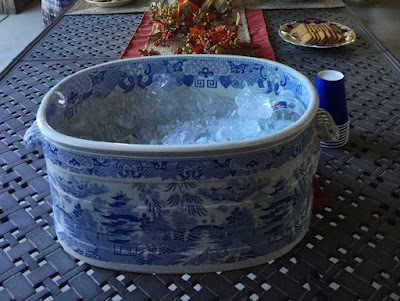 Another use for a foot bath. An ice bucket! Anyone recognize the pattern? 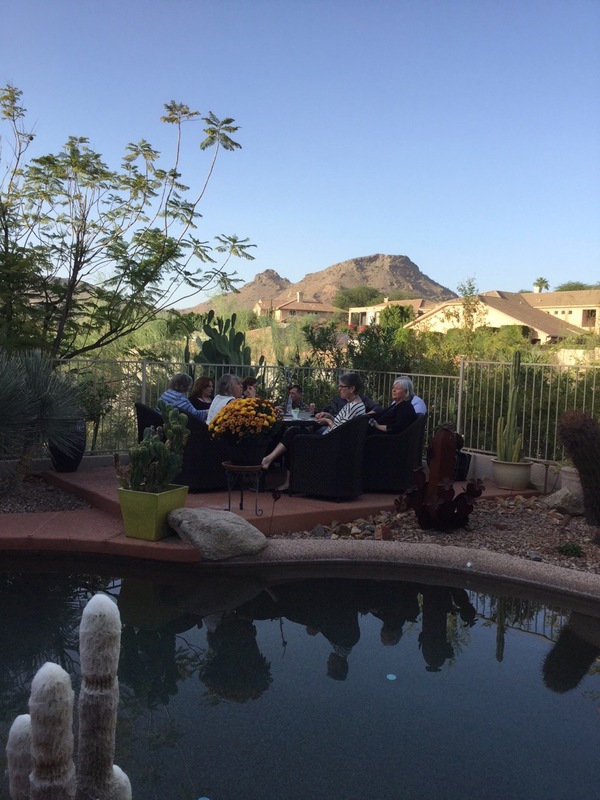 TCC members relaxing in the desert. The temperature in late October was perfect. One more thing. You never know where you are going to find transferware! In the desert. 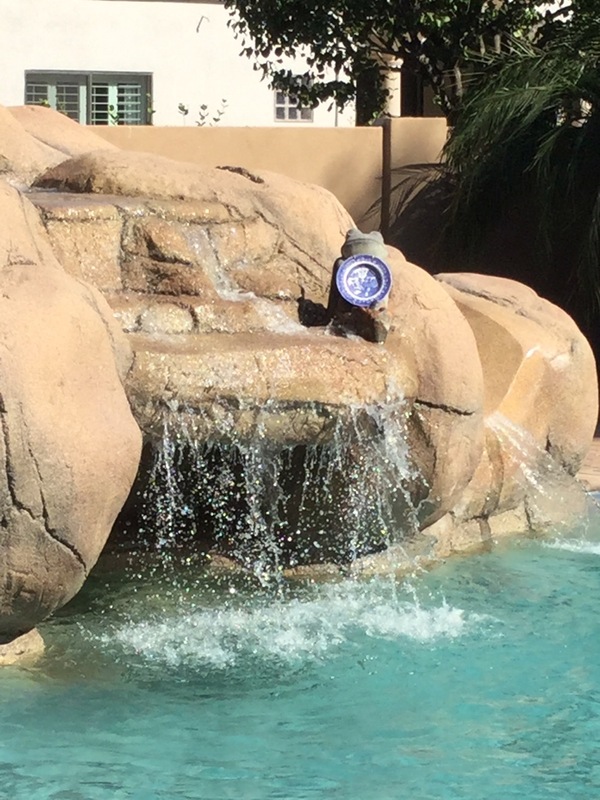 Or, perhaps by the pool!